Breakfast Meal Prep is the best way to get your morning and week off to a healthy start! 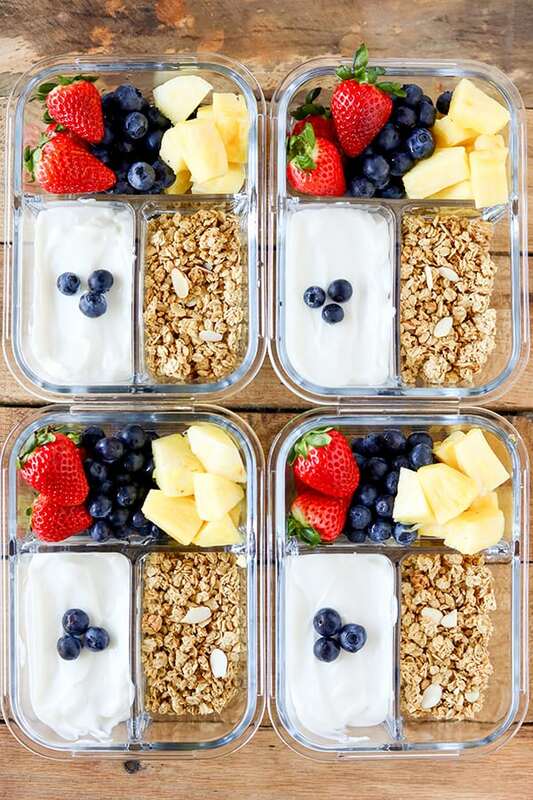 Packed with protein, fresh fruit and a sprinkle of low-fat granola, these Fruit and Yogurt Bistro Boxes are a fresh idea for busy mornings. Having a healthy breakfast on hand that you can grab and go is the best way to stay on track for the day. This easy breakfast meal prep idea is quick to prepare and packed with protein. You can find these pretty glass meal prep storage containers here . The divided container makes it so easy to portion the ingredients. 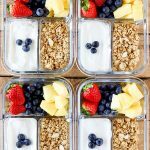 For this meal prep recipe, I used fat-free plain greek yogurt, low-fat granola and my favorite fresh fruits. It’s perfect for customizing. If you need even more staying power, try using whole milk greek yogurt. 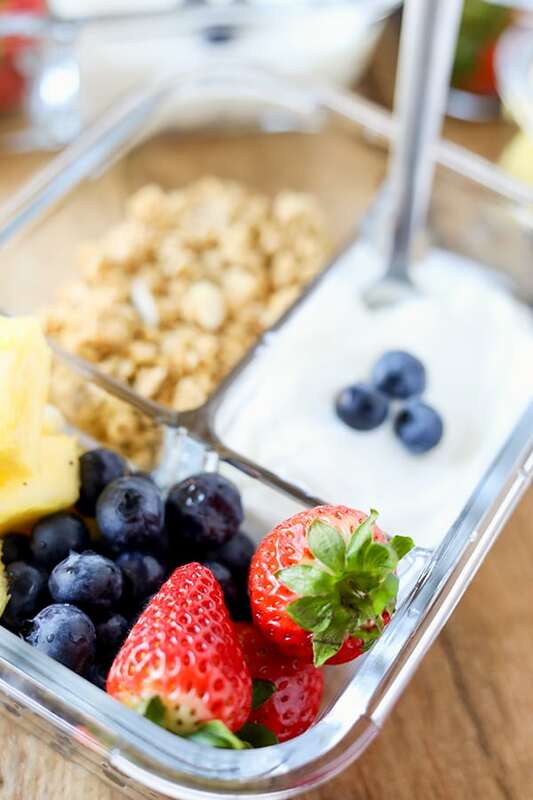 Sometimes I crave a hearty breakfast to start the day, but sometimes I want something that feels light and fresh like these fruit and yogurt boxes. These are great for a refreshing mid-day snack too! If you follow the Weight Watchers Freestyle plan, these boxes are just 3 Freestyle points. Zero points for the fat-free plain greek yogurt and fresh fruit, and 3 points for 1/4 cup of low-fat granola. 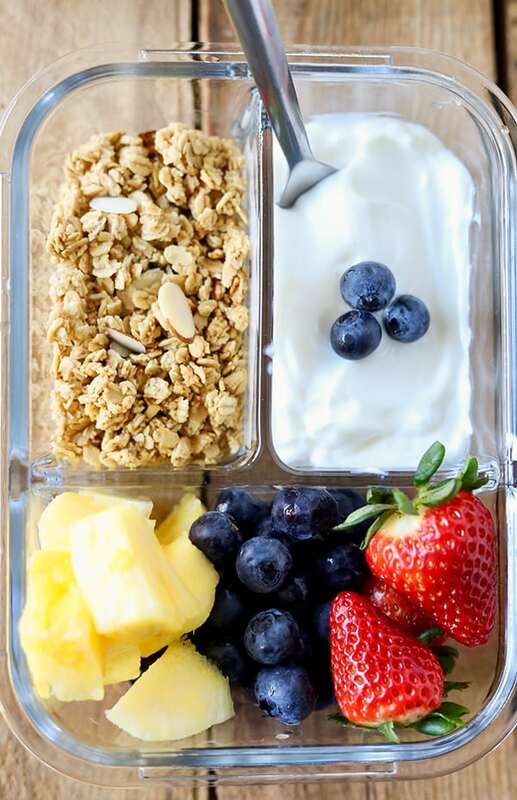 Assemble fruit and yogurt bistro boxes by dividing ingredients evenly in boxes. Keep refrigerated.